Today I am posting another recipe, which is suitable for a festive occasion. Wild boar with sage and honey. Wild boar isn’t something we cannot get everyday in Greece. We can, however, get it during the Christmas and New Year’s holidays, so I plan to make it during the holidays. During these holidays, I usually make stuffed lamb or goat and occasionally roasted boar. 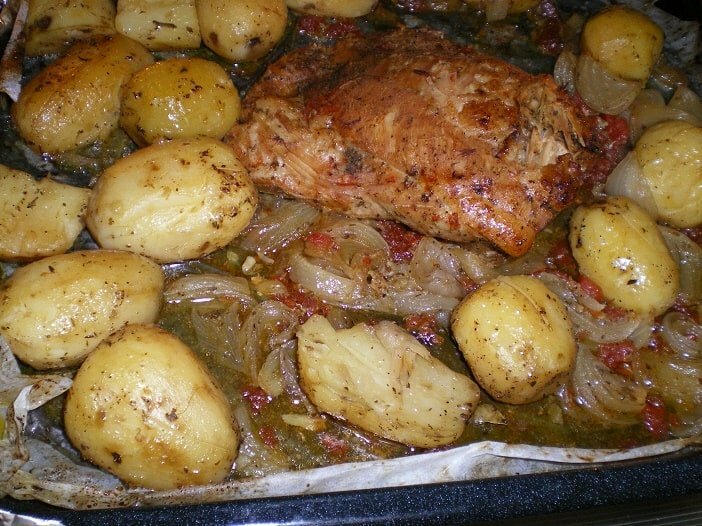 This recipe, however, I found very interesting and as I could not try it on wild boar, I tried it with pork and I must say it was delicious. Wild boar and pork taste great with some Mediterranean herbs such as oregano, thyme, sage, rosemary, tsai tou vounou (Greek mountain tea or Sideritis Athoa), laurel etc. During the Christmas holidays, I did find some wild boar and made the recipe again. Of course, the meat of wild boar tastes different than pork but in both cases it was delicious. Add half an hour more baking time for the wild boar. For those who don’t know: Apart from wild boars living in the wild there are farms where they are bred for this purpose. Of course during the hunting period some hunters, unfortunately, hunt them as well. Baking time: about 2 hours and 30 minutes. ½ teaspoon of red hot ground chilli. Wash the meat and strain the water. Pound the garlic and rub the meat with the mustard and the honey, sprinkle with salt, pepper and chilli and place in a bowl. Add orange juice, oil and vinegar, as well as the bay leaves, pound sage, rosemary, thyme and oregano (keep a little from four last ingredients for later on) and marinate for 2 – 3 hours in the refrigerator. Preheat oven at 200 degrees C.
Peel, wash and cut potatoes, if needed and pierce all the small ones with a sharp knife so that the steam will penetrate through and cut the bigger ones in two or four pieces. Place in a bowl and sprinkle with salt, pepper and the four ingredients we kept, thyme, rosemary, sage and oregano. Place a big piece of parchment paper in your tin and put the meat on the paper. Place the potatoes around the meat and cut the onions and peeled tomatoes into small slices. Add the marinade and cover with the parchment paper. Cut two big pieces of aluminium foil and cover the tin air tight. Place tin near the centre of oven and reduce temperature to 180 degrees C and roast for two hours (or 2 hours and thirty minutes for wild boar). Remove foil and top of parchment paper and bake until potatoes are ready. Yum, Ivy, you are so lucky to be able to buy wild boar — it has such good flavor. It’s just not available in Alaska. Do you get it at your local market, or do you have to go to the Central market for it? Bravo Ivy, the pork looks great! I can just picture all of you dipping your psomi in the nostimo sauce in the “tapsi”. Yes Laurie we get it at all butchers during the holidays.